Between 3-4:00 am: Babies are crying. I nurse them, half asleep. Putting them back into their bunk without dropping one is an effort. Walk back to the aft cabin like a cat burglar - any creaking floor board might wake up Isla who is sleeping in the walk-through. I know where to step to make no sound. I am Katherine Zeta-Jones a la Entrapment. Back to sleep for me. 6:30/7:00 am: Everyone up for the day (Note: this is one of two *very* hectic times on our boat). Babies diapers get changed and they are let loose. I make our bed and convert Isla's bunk back into a functional walk-through/work area. Scott starts breakfast. Where is the coffee???? 9:00 am: Haven and Mira down for their morning nap. Siiiigggh. 9:15-10:30 am: Laundry that was soaking overnight in our bucket outside is agitated, rinsed and hung out to dry. Boat is re-organized after playtime. I begin to meal plan for the day and begin to prepare both lunch and dinner (Note: meal times are the bane of my existence. Ugh.) Isla and daddy swim, play or go ashore. 10:30/11:00 am: Babies are up from their nap. Diapers changed. All kids lathered in SPF 50 sunscreen. Screaming usually ensues for a hot five. 11:00 am: Possible dinghy ride or short shore excursion. Usually play time on the boat in the cockpit with toys. 12:00 pm: Lunch time for the crew. Something simple, tuna salad sandwiches, grilled cheese, macaroni and cheese, quesadillas...etc. We eat on deck where food can fly freely and squeals and screams can echo through the anchorage without disturbing too many people. Twin babies eating = mess of epic proportions and lots of noise. 12:30 pm: Clean up from lunch time, babies play before their afternoon nap. 1:00 pm: Haven and Mira nurse and down for their afternoon nap. Siiiggghh. 1:30-2:30 pm: PEACE REIGNS AND ALL IS BLISS. 2:30 pm: Babies up from their nap. Diapers changed. Playtime. We try desperately to keep them quiet so they (cough, cough, Haven) don't wake Isla. 2:30 pm: While babies play Scott and I prepare for the afternoon shore excursion by packing up the beach bag with a few toys, towels, snacks, strollers and/or anything else we might need depending on what we do or where we go. We try to be as prepared as possible so that right when Isla wakes up, we can go - time is of the essence! 3:00 pm: Isla up. We round up the troupes, put them all in their life jackets and load everyone and everything into the dinghy. This is - at the bare minimum - a ten minute endeavor, and that is with all the preparation we did an hour earlier. If any particular child has a meltdown (usually Isla these days), tack on another ten minutes. 3:30 pm: At shore. Walk. Park. Beach. Swim. Whatever the area offers. 5:10 pm: Babies eat dinner. I start the dinner for Scott, Isla and I. I fill the baby inflatable tub with water. Fill our laundry bucket with soap and water. Who says I can't be in two places at once?! 5:30 pm: Babies have bath in their inflatable bath tub at the back of the boat and their clothes go into the laundry bucket. They now try to climb out of said tub so this is a game of "keep slippery baby in the bath" - they enjoy it immensely. I do not. Whack. A. Mole. Towel off. Hand baby to Scott. Towel off, bring other baby down below. Fresh diapers and jammies. 5:55 pm: Nurse the twins and put them into bed. They play quietly together for a bit and then fall asleep. Unless Haven jumps on Mira, at which point screaming ensues for a bit. Then sleep. 6:15 pm: I jump off back of the boat and shower. My clothes go into laundry bucket. Bliss moment. Sun is setting. Air is cooling. 6:30/7:00 pm: Dinner for Scott, Isla and I. We talk about our day. Namely: "Holy crap. We are doing this." 7:30 pm: Isla story time and bed time. This is a difficult part of our day and usually involves bribing of some sort. 8:00 pm: PEACE REIGNS AND ALL IS BLISS. 9:00 pm: I head to bed, read a bit and fall asleep, but not before saying a little prayer that the kids all sleep well and don't wake up too much in the night! As I said before, there are certainly moments where life is two or three times more exhausting than it would be on land, but then we remember that this period is so short, so fleeting and that to be able to spend so much time with them, doing something so wonderful - will pay off great dividends one day. Soon - before we know it - our girls will be less dependent, and more manageable and life will get easier. It will still be challenging, of course, that is life with children - but in new and different ways. To us, the huge benefit of bringing babies on boats early is the simple fact that by the time they are two or three, they are old salts. We hardly worry at all about Isla on the boat. She knows how to climb around, knows how to maneuver, has exceptional balance and understands the dangers around her. And she's not even three! We keep reminding ourselves that having our twins start so young will mean they will be much easier in a year. We knew this wasn't going to be easy, and having those realistic expectations has been hugely helpful in this adjustment period. Because spare time is such a precious commodity around here, I will not be blogging as regularly as I was last time we cruised (my goal is two posts a week, max), so if you want to keep closer tabs on us - please check out our Facebook Page. It's much easier to post pictures and updates real-time over there. More to come. I have so much to write about. I'm inspired like crazy out here. Sigh, if only I had the internet bandwidth and the time. transition times are the issue. Always will be. It never gets better, just different. As the father of three (now grown) boys, I applaud your insight. My mother (who had 4 young boys herself) said almost those identical words when my boys were your girls’ ages. Because of that, I learned to try to embrace the moment when things got really nuts. I, like you, did not always succeed, but I did learn to try and laugh at the crazy situations we found ourselves in- and we weren’t on a boat! Love, laugh, and squeeze them tight. Those moments will be gone before you know it. Keep it up, you are doing it! I have to say, you two have some serious cajones. I couldn't have done it (I have two, now grown, boys). Keep it up. Time will pass. In a couple of years, Isla will be old enough to help, and the twins will be out of diapers. Life will be easier. It will start to get fun. Meanwhile, WINE. Isn't it insane how much time us parents spend... preparing food, feeding, cleaning up after feeding?! Seriously. Some days I want to feed them pouches and cheese sticks...all day. I don't have children at home any more and meals are still a hassle. I would like to eat Cheerios and milk and the occasional pound of bacon. Seriously, twenty one meals a week for two adults is a pita. How did I do it when I had a family? Kudos to both of you for getting out there and handling life; while on the hook. Seven years to retirement. I hope we can have even a small percentage of the fun you guys are. And yes, live life in the moment and find joy in every day. They grow up in the wink of an eye. I've so been enjoying your blog. I sailed a lot on my little Sunfish as a kid / teenager. Now as a parent with three small kids (not as small as yours) I'm rekindling my interest in sailing and trying to bring the family along with me. 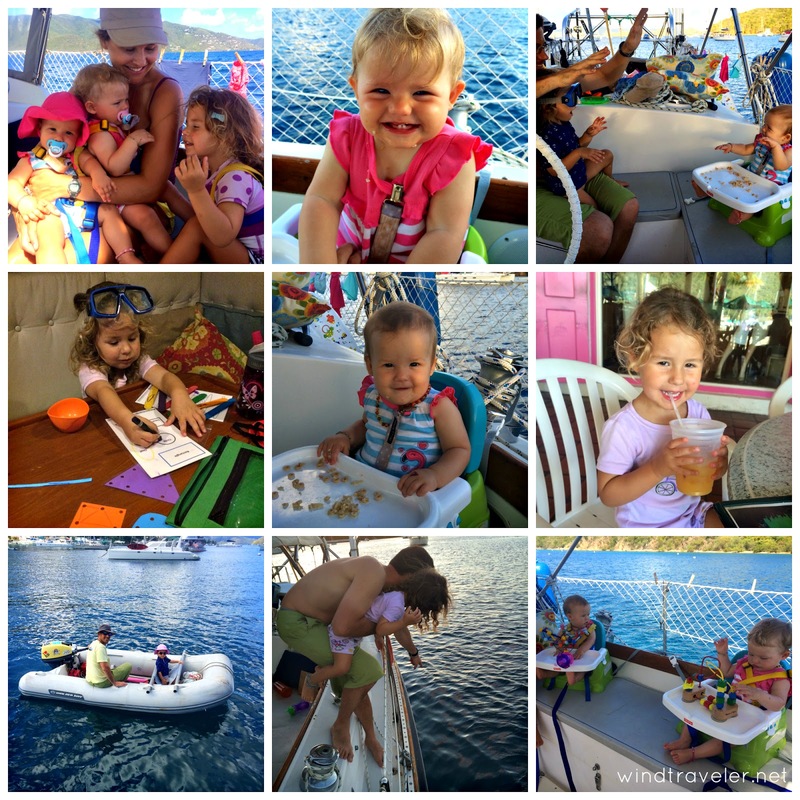 Bloggers such as you and S/V Delos serve as a nice inspiration. The catalog of your daily routine and mention of wouldn't it be nice to have a time-lapse video of your day reminded me that I do have a time-lapse video of one of our day sails on the Columbia River in Portland, OR. Enjoy, whenever you have some Internet and personal bandwidth.